A unique presentation of abnormal body posture seen in approximately 5-10% of post-stroke patients ,. First described by Patricia Davis in 1985, ‘Pusher Syndrome’ is a term used to describe the behaviour of individuals using their non-paretic limb to push themselves towards their paretic side. Left unsupported, these patients demonstrate a loss in lateral posture, falling on to their paretic side . Pusher Syndrome is often accompanied by severe inattention and hemisensory impairments ,. Karnath and Broetz  identify three diagnostic factors of Pusher Syndrome, as shown below. 1) Spontaneous body posture- (severe/moderate and mild). The patient’s initial posture shown immediately after a positional change (ideally supine to sit/ sit to stand) must be assessed for contralateral tilting. This can be seen with or without falling to the side contralateral to the brain lesion. It is felt that patient’s must demonstrate this postural abnormality regularly to be classified as suffering with Pusher Syndrome. Patients demonstrate abnormal positioning of the side ipsilateral to the brain lesion. Typically the hand will be abducted away from the body, the elbow held in extension and the hand searching for contact with a surface on which to push oneself to the perceived upright position. The lower limb may be abducted, with the knee and hip held in extension (as with the upper limb). Patients will typically actively resist against therapist’s manual interventions to correct their body posture. The patient’s extended upper and lower limbs will be used to push their weight towards their paretic side. Subsequently, the Standardized Scale for Contraversive Pushing (SCP), has been formulated on these 3 deficits. The SCP is a useful tool for clinicians to classify Pusher Syndrome, and is quick and easy to apply in both an acute and rehabilitation setting . 3. To assistance during transferring and walking. 3. The resistance to passive correction of the tilted posture (0 or 1 point). Bergmann et al suggested that the Burke Lateropulsion Scale is more sensitive to small changes in presentation and is more responsive in classifying Pusher behaviour than the Scale for Contraversive Pushing. In addition it was suggested that the Burke Lateropulsion Scale is especially useful to detect mild or resolving pusher behaviour in standing and walking. Karnath and Broetz  suggested that the first goal of initial rehabilitation is to provide visual feedback of the patient’s altered body posture. 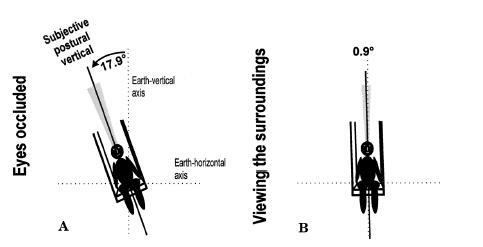 By providing patients with visual information in relation to their environment they are able to feel they are in an erect posture when they see that they are tilted. While in different postural sets patients should be asked whether they see if they are upright and given visual references/ cues to help them orientate themselves to upright and given them feedback about their body orientation. For example by using ground-vertical structures- ie a therapist’s arm held upright to demonstrate true upright orientation, a line on a wall or a door frame. Although patients with Pusher Syndrome may initially need prompting with the use of visual feedback it is hoped that, with regular therapy, patients are able to apply training procedures independently and utilise their environment for gaining visual feedback from vertical structures. Enable the patient to realize the disturbed perception of their body position. Enable the patient to visually explore their surroundings and the body's relationship to their environment and see whether he or she is oriented upright. Reference points can be used such as the therapist's arm or many vertical structures, such as door frames, windows or pillars. Practicing movements necessary to reach a vertical body position. Abe et al suggested that when considering length of rehabilitation stay that laterality and prognosis of Pusher Syndrome should be considered at the time of goal setting for rehabilitation. There are conflicting opinions in the literature with regards to the persistence of Pusher Syndrome in the longer term and its impact on functional outcome. Some authors report that the presence of Pusher Syndrome is rarely seen 6 months post stroke and is shown to have no negative impact upon patients’ ultimate functional outcome, although it has been shown to slow rehabilitation by up to 3 weeks . However, a case study by Santos-Pontelli et al reported the lingering presence of Pusher Syndrome in 3 patients up to two years post-stroke, with profound negative impacts upon their functional abilities. In a study by Babyar et al they reviewed whether the number of impairments patients with Pusher Syndrome had, was a determinant on the level of recovery achieved  From their findings they proposed that 90.5% of patients studied with only a motor presentation were able to 'recover' (scoring 0 or 1 in the Burke Lateropulsion Scale) from Pusher Syndrome within 27 days. Those patients with with 2 deficits achieved the target in about 59% of cases.For patients with motor, proprioceptive, and visual–spatial impairments or hemianopia however, only 37% of patients were able to achieve a score of 0 or 1 on the Burke Lateropulsion Scale prior to discharge. ↑ 4.0 4.1 4.2 Santos-Pontelli TEG, Pontes-Neto OM, de Araujo DB, Santos AC, and Leite JP. Persistent pusher behavior after a stroke. Clinics (Sao Paulo). 2011; 66(12): 2169–2171. ↑ Perennou DA, Amblard B, Laassel el M, et al. Understanding the pusher behavior of some stroke patients with spatial deficits: a pilot study. Arch Phys Med Rehabil. 2002;83:570-575. ↑ 7.0 7.1 Babyar SR, Peterson MG, Bohannon R, Pérennou D, Reding M. Clinical examination tools for lateropulsion or pusher syndrome following stroke: a systematic review of the literature. Clin Rehabil. 2009;23:639-650. ↑ Karnath HO, Johannsen L, Broetz D, Küker W. Posterior thalamic hemorrhage induces “pusher syndrome”. Neurology. 2005 Mar 22;64(6):1014-9. ↑ 12.0 12.1 12.2 Bergmann J, Krewer C, Rieß K, Müller F, Koenig E, Jahn K. Inconsistent classification of pusher behaviour in stroke patients: A direct comparison of the Scale for Contraversive Pushing and the Burke Lateropulsion Scale. Clinical rehabilitation. 2014 Jan 23:0269215513517726. ↑ Karnath H-O, Ferber S, Dichgans J. The neural representation of postural control in humans. Proc Natl Acad Sci U S A.2000 ;97:13931–13936. ↑ Karnath HO, Broetz D. Understanding and treating “pusher syndrome”. Physical therapy. 2003 Dec 1;83(12):1119-25.